All the time, inspiration, tips, techniques and challenges role through my Google Reader. And many of them make me think "Ooh, I want to do that!". But in between scrapping the things I want to scrap anyway and ..y'know, life, I never seem to get round to it. All that is about to change, now that I'm tackling Challenge 10: Take up an internet challenge on my challenge list And the challenge I chose was Take 1, a challenge set by SJ on her blog Little Musings. Every fortnight, she looks back through her pages, chooses one that catches her eye and scraps a new page, borrowing a particular element from the old one. And she shares her own pages in a lovely video. 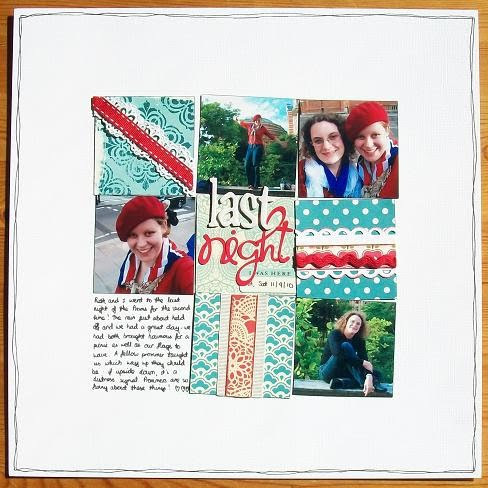 I thought this was a brilliant idea - self-inspiration means we can celebrate the things we love in our own scrapbooks. This is the page I chose for my inspiration. I made this page about going to the Last Night of the Proms just over a year ago in September. I really like the mix of patterns and the way the red-white-blue colour scheme echoes the Union flags in the picture. So I borrowed those things for my new page, made with this year's Last Night of the Proms photos. Red white and blue colour scheme, mix of patterns. I spy checks, polka dots, clouds, stars and the all important ledger :D I also included some stitching for good measure, and a bit of grey to add into the colour scheme. We had a great day at the Proms - I still have more to scrap - but I did want to document these awesome bowler hats. We were sat on the pavement waiting to get tickets for the concert (ten hours folks!) and over the road, I could see some people handing out hats to other queueing concert goers. Heedless of my own safety, I dashed across the road (gasp! shock!) and went to get one. Were they free? Yes. Score! Could I have one? Yes. I mimed across the road to the other folk in the queue. It's quite hard to mime: "these people are giving out bowler hats for free and I'm not sure why but free is free so do you want one?". But I managed, the folk across the road thumbsed-up, and I tottered back across the road clutching half a dozen. We assembled our hats by making sure the extremely classy Union flags were secured to the top, and carried on queueing. In our frankly awesome new headgear. Win. They helped to keep off a bit of the rain. I snapped this self portrait of me and the friends with my fisheye (by the way friend, I hope this photo meets your approval. You know who you are), umbrella bobbing behind us, wearing our definitely-not-ridiculous hats and flying our flags the right way up too. We are not in distress. P.S. Last challenge tomorrow! Which means I have to finish off the page tonight. Stop by on the tenth to share your creations if you've been challenging yourself too, and to see the full round up!